Missouri could become the 31st state to legalize medical marijuana after voters weigh in Nov. 6 on three ballot issues. That's right, there are three different proposals to legalize medical marijuana in the state, each with a different twist on its implementation. KANSAS CITY, Mo. — Missouri could become the 31st state to legalize medical marijuana after voters weigh in Nov. 6 on three ballot issues. That's right, there are three different proposals to legalize medical marijuana in the state, each with a different twist on its implementation. All three proposals would allow patients with cancer, epilepsy and other conditions to consume and possess medical marijuana, but tax rates are among the biggest differences. Amendment 2, which is backed by New Approach Missouri, focuses on medical marijuana to help veterans. It would impose a 4-percent sales tax to create a new fund for veterans' health care. 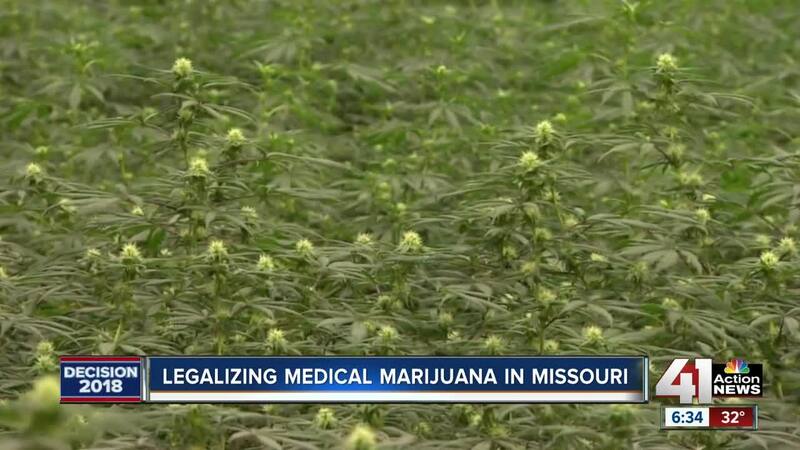 “It allows patients to work with their doctors to determine if medical marijuana is an appropriate treatment option,” said Jack Cardetti, spokesman for New Approach Missouri. Amendment 3, which is financed by Springfield attorney and doctor Brad Bradshaw, would tax medical marijuana sales at 15 percent with the funds going to cancer research. “It will create 10,000-plus new jobs (and) it will create billions of economic impact for the state of Missouri,” Bradshaw said. Proposition C, which is supported by Missourians For Patient Care, would impose a 2-percent sales tax on medical marijuana with the proceeds benefiting veteran care, drug treatment, early childhood education, and public safety. Opponents of all three measures said medical marijuana is not safe, pointing to other states where similar measures passed. “They've actually seen their crime rates increase (and) they've seen their rates of impaired driving crashes increase, so there are a lot of subsidiary problems that come along with the legalization of marijuana that I'm not certain Missouri is prepared to deal with,” Platte County Prosecuting Attorney Eric Zahnd said. Zahnd believes what’s on the market now works without the THC component. “There are at least three different drugs that are already on the market that are made from derivatives from the marijuana plant," he said. Missouri legislative researchers predict more than $100 million of medical marijuana could be sold annually if it becomes legal. According to state law, the constitutional amendments would supercede current state law. If both constitutional amendments pass, the one with the most “yes” votes take effect.